First of all a warm welcome from all of us, the friendly staff and the Dutch owner Anton. Welcome to the website of Topi Inn! 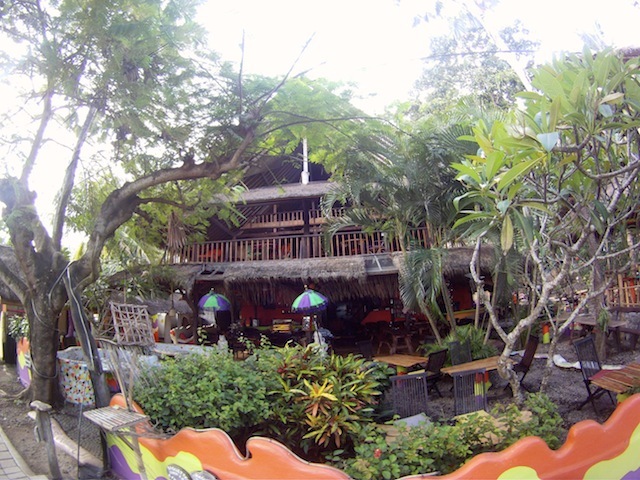 Topi Inn is located in the protected bay in Eastern Bali, 75 minutes drive from Denpasar Airport. We are happy to have one of our drivers meet you at the airport and bring you directly here, if you would like to recover from your long flight in this relaxing beach resort. Padangbai’s attractions are the tranquility, the friendly atmosphere (great for families), white sanded beaches, a bay where you can swim safely (ideal for kids), great snorkeling and diving, all within walking distance and far away from the tourist hustle bustle area and hectic traffic, but still within close range of most other attractions and interesting places in Bali. For the adventurists we organize beautiful nature walks, fun tours on motorbike on the back or front, with car or boat and sport fishing trips. Padangbai keeps most visitors surprisingly intrigued by the endless possibilities of leisure. Our concept is to enhance comfort, relaxation and especially to give you the opportunity to get to know some of the ins and outs of the Balinese culture and religion by participating in one or more of our interesting workshops during your holiday.